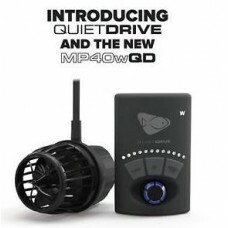 The Ecotech Marine Vortech Quite Drive MP series is the Cadillac of the aquarium powerhead market. 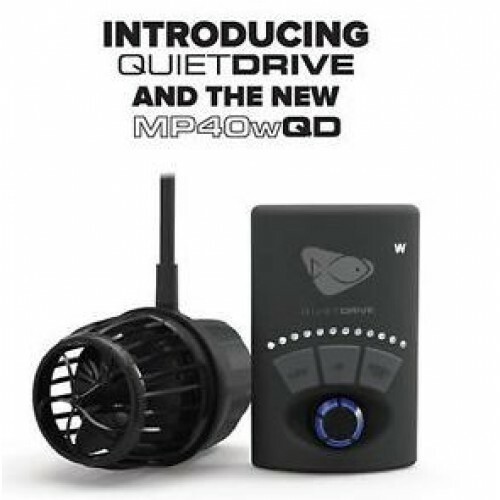 The newly redesigned powerheads now have a “Quite Drive Technology” making them one of the quietist pumps on the market. 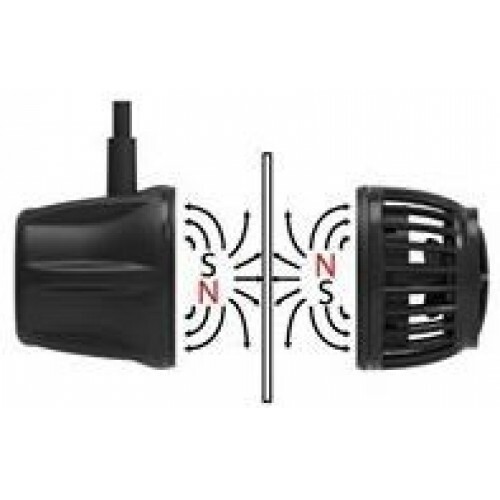 The Vortech series of powerheads come in three sizes the MP10, MP40 and MP60 with the available “Quiet Drive Technology” these powerheads are leading the pack in saltwater and freshwater aquariums. 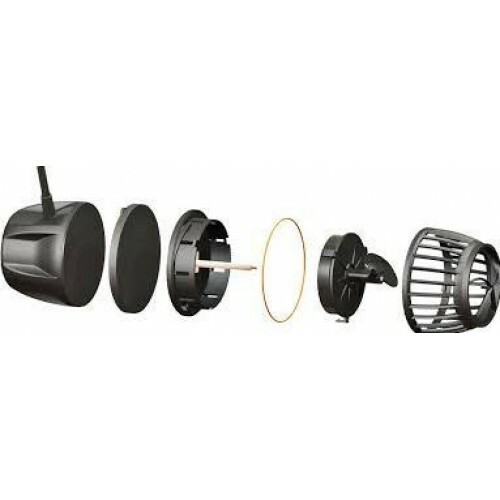 The Vortech Mp 10 is capable of producing 1,500 GPH in flow and only uses 8-18 watts of power. The best size tank for the MP10 is 2.5-50 Gallons and the max glass thickness for proper installation is 0.375. The Vortech MP 40 is the next size up and has an amazing reputation as the go to powerhead for the busiest of Reef tanks. 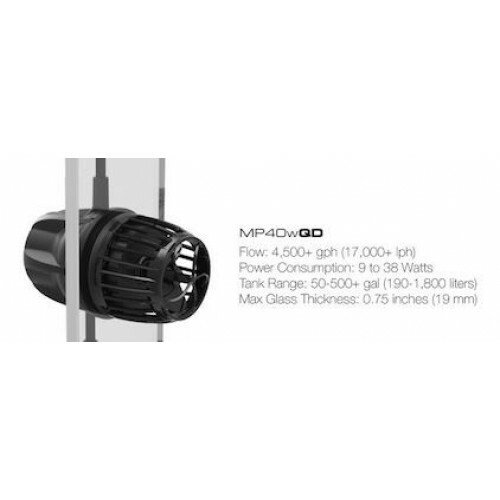 With a 4,500 plus GPH flow the MP40 can handle just about any aquarium situation. 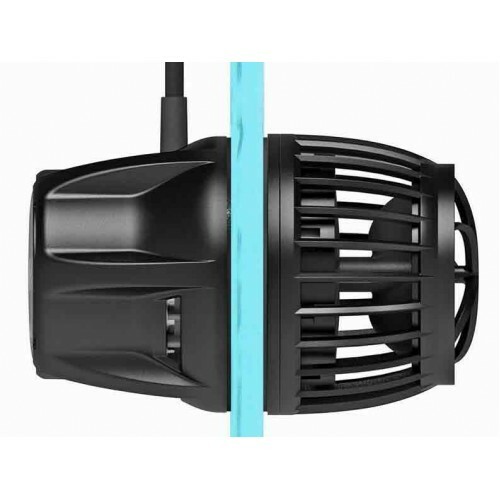 Clearance Needed Behind Aquarium: 2.5"
The Vortech MP60 is by far the biggest powerhead the EcoTech makes, it can handle up to 7,500 GPH of flow and only consumes 10-60 watts of power. 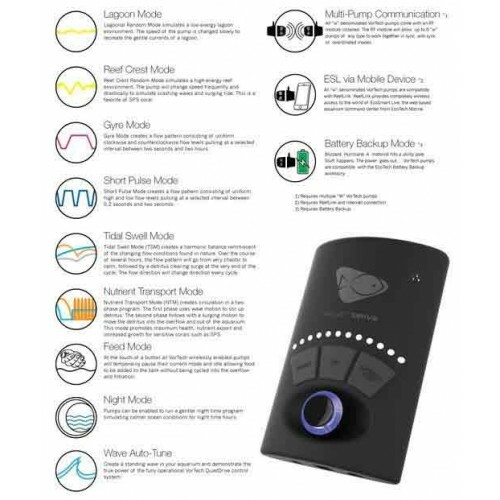 Max Glass Thickness Range: 0.375" - 1.00"
Clearance Needed Behind Aquarium: 3.25"
When used with the EcoTech battery backup accessory, the VorTech pump will switch to Battery Backup Mode in the event of a power outage and will operate at a user set speed. 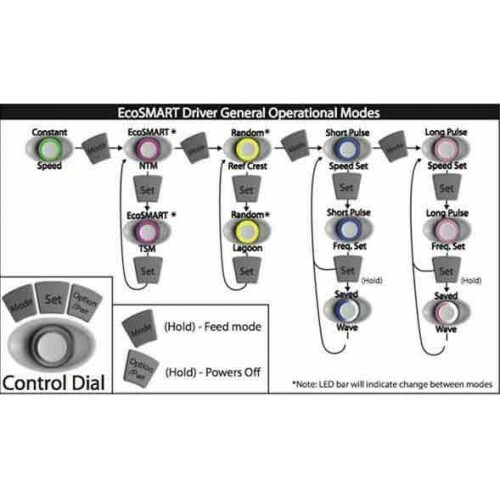 The LED’s on your EcoSmart driver will count down to indicate how much power is available within the battery. LEDs are turned off and display knob dimmed significantly, but pumps functions in its current mode. User can program how long after use before the driver enters Auto-Dim. 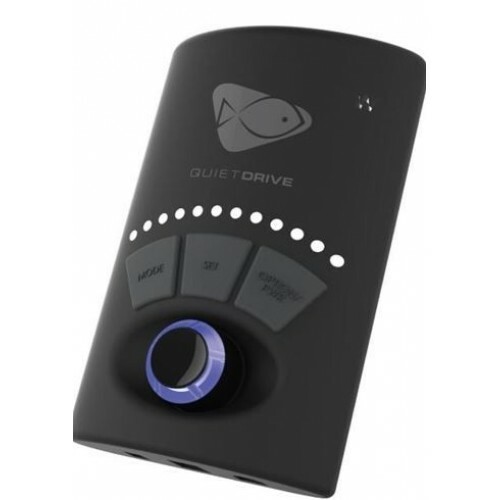 Tap the on/off switch to turn off and turn on a pump. Hold this button to turn off all pumps in a master/slave group. Tap any pump in the groups’ on/off switch and that pump will turn back on.